A design flaw in a Russian Fregat upper stage was responsible for the botched orbital injection of two European Galileo navigation satellites in August, officials said Wednesday, causing hydrazine fuel to freeze inside the rocket’s maneuvering system and rendering it unable to point in the right direction during a critical engine burn. The frozen hydrazine propellant disrupted fuel flow to two thrusters that were supposed to control the orientation of the Fregat rocket stage as it coasted through space after liftoff Aug. 22. Engineers found that hydrazine fuel and super-cold helium pressurization lines were routed too close together and connected through a support structure that served as a thermal conduit, triggering the hydrazine to freeze and block the fuel line. The anomaly meant the Fregat upper stage was unable to correctly maneuver into the correct attitude for a main engine burn to put the Galileo navigation satellites into a planned circular orbit 23,500 kilometers (14,600 miles) above Earth. With the rocket pointing in the wrong direction, the Fregat engine firing propelled the Galileo satellites into an orbit with a perigee, or low point, below the targeted altitude and an apogee, or high point, above it. 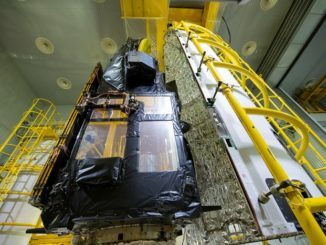 The Fregat stage’s manufacturer, NPO Lavochkin of Russia, has agreed to change its design documents to guard against the close placement of hydrazine and helium lines, and use clamps made of less conductive material, according to Arianespace, the failed mission’s launch services provider. Technicians also discovered other Fregat stages on the ground had the same type of proximity between hydrazine and helium plumbing that led to the Aug. 22 mishap. “These measures can easily and immediately be applied by NPO Lavochkin to the stages already produced, meaning that the Soyuz launcher could be available for its next mission from the Guiana Space Center as from December 2014,” Arianespace said in a statement Wednesday. At least one Soyuz launch with a Fregat upper stage is scheduled from Russia before the launcher returns to flight from French Guiana. Before the Aug. 22 launch anomaly, two more Galileo navigation satellites were scheduled to lift off on the next Soyuz flight from French Guiana in December. But two officials with knowledge of Galileo program planning said Wednesday that the next launch of European navigation spacecraft will slip to next year. The December launch opportunity — set to be the 10th flight of a Soyuz rocket from French Guiana — will likely go to O3b Networks, one government official said. Based in Britain’s Channel Islands, O3b Networks has eight satellites in orbit 5,000 miles above the equator providing broadband Internet to customers in the developing world out of reach of terrestrial broadband networks, boosting data throughput and connection speeds in homes, businesses, schools and hospitals. Four more O3b satellites are under construction at Thales Alenia Space’s factory in Rome and could be ready to launch in December. The European Space Agency and the European Commission, the 28-nation European Union’s executive body which manages the Galileo navigation system, will decide later whether the next navigation satellites will launch in a pair on a Soyuz rocket or four at one time aboard Europe’s more powerful Ariane 5 launcher. ESA acts as a technical agent for the Galileo system on behalf of the European Commission. The $7.2 billion program is a civilian-run counterpart to the U.S. Air Force’s Global Positioning System. When complete, the Galileo fleet will consist of 30 satellites scattered in three orbital pathways around Earth to ensure continuous global coverage. Airbus Defence and Space, the Ariane 5’s prime contractor, plans to complete qualification of an adapter to hold four Galileo satellites in time for a flight next year. ESA and the European Commission signed a launch contract with Arianespace in August to send up 12 Galileo satellites on three Ariane 5 rockets. Four more Soyuz launches from French Guiana are booked to deploy eight Galileo satellites into orbit. The satellites launched Aug. 22 were the first of 22 Galileo spacecraft built by OHB System of Bremen, Germany, to reach space. They joined four in-orbit test satellites launched in 2011 and 2012 to validate the technologies behind the Galileo navigation system. The satellites are healthy and fully functional, but they do not carry enough fuel to overcome the launch shortfall, meaning officials must find a use for the spacecraft while they operate in the wrong orbit. Officials said the satellites could be tested to verify the performance of the OHB-built spacecraft, which have a different design than the validation platforms previously launched. They could also be included as operational members of the Galileo network without reaching the same altitude as the other satellites. But if the spacecraft are stuck in an orbit closer to Earth, they will have less visibility to users on the ground. The orbit injection error was the first anomaly with a Fregat upper stage in 45 missions since its first flight in 2000. Two investigation panels appointed in Russia and Europe concurred on the cause of the Aug. 22 launch mishap. The inquiry board set up by Arianespace, chaired by former ESA inspector general Peter Dubock, concluded that the three-stage Soyuz booster performed normally and traced the anomaly to about 35 minutes after liftoff. 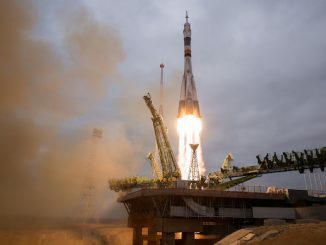 The Soyuz rocket took off with a Fregat upper stage, which was designed to take over control of the flight about 10 minutes after launching from the Guiana Space Center in South America. The Fregat stage’s main engine was supposed two fire two times to put the Galileo satellites in the targeted circular orbit. In a statement Wednesday, Arianespace chairman and CEO Stephane Israel thanked the European inquiry board that looked into the mishap.